This is the true story of Jim Jones who lead a church/cult. 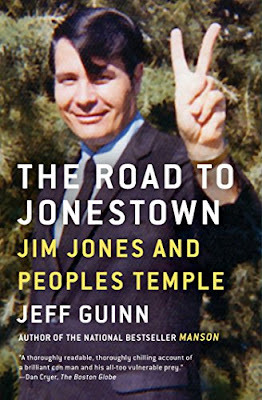 He and over 900 of his members in Jonestown (in Guyana South America) killed themselves in November, 1978 because they thought (According to Jones) that the US govenment was after them. Among the dead were over 300 children. Jim Jones started his People's Temple with the idea that he was going to bring equality among minorities and whites in America. He lived a socialist, communist style life with his followers - everyone sharing equally and giving back to the poor. But over time, Jone's paranoia, drug use, and delusions of grandure lead to the downfall of the church and the loss of almost 1000 lives. This book follows Jones from even before his birth (there is extensive information about his mother and father), his childhood upbringing with a drunk disabeled father and a distant mother, and his beginnings as a minister. Even from a young age, Jones became interested in religion but not from the standpoint of God being the center, but community. His churches stretched from Indiana to California and then finally to Guyana. The book goes into detail about his entire life from marriage to children to what he was trying to accomplish with his church, and it is eye opening. This was a very interesting book. I am sure at some point I was aware of Jim Jones and this story (I was only 3 years old when the suicides occured), but I don't recall it. The author has done a good job in retelling the story from the FBI files and interviews he conducted related to Jim Jones, his followers, and the Temple. The author is good at keeping a steady, unbiased telling throughout the book. It is a long book, but I encourage you to read it. I am always a fan of a well written non-fiction. So check this one out.